Need a little getaway time with your special someone? 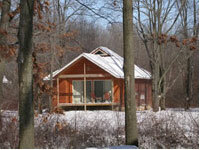 Escape to private cabins tucked away in a country setting at Serenity Springs in Michigan City, Indiana. With the chill of winter in the air, the thought of cuddling up with a loved one, staying toasty with heated floors and a serene fireplace in one of their cozy cabins sounds perfect! If you love the outdoors, take in the beauty of the area with a ride in their "one horse open sleigh" or a brisk walk through the snow covered wooded trails. Afterwards, you can snuggle up by your private campfire, roast s&apos;mores then relax in your sunken whirlpool tub while anticipating a surprise delivery in their exclusive "butler door." Every bungalow is architecturally unique ensuring that each escape at Serenity is special. One bungalow is the Swan which boasts a high ceiling with raised windows along each side providing an open feeling. The Keepsake Rose is decorated with pink roses and has lower beams wrapped in sheer pink lace with lights and heart shaped tub. Each water front bungalow is complete with a king sized bed, sunken whirlpool for two, gas fireplace, surround sound satellite entertainment system with FM/AM and DVD Player, and even a gas campfire on the deck. All full service reservations include a carriage/sleigh ride if available, soda and juice, snack basket, breakfast basket and surprise deliveries! Take advantage of their winter specials running this month. January 14th is their annual "Wine...Winter...Wonderland" event including an overnight stay, wine tasting, bottle of wine, and dinner provided by Scartozzi&apos;s Trattoria at Shady Creek Winery. Their "Winter Warm Up Weekend Special" runs through January 29th for a two night escape. Or try the "Chillin and Grillin in January" special for a carriage ride, two danish and coffee in the morning and grilling on your own private gas grill or pizza service. Find out more about Serenity Springs.